Every film or video shoot calls for at least two camera assistants. Camera assistants (or first and second ACs, as they're known) have the important job of maintaining the camera, readying it for use, troubleshooting (such as knowing what to do when a camera drops into the ocean), and preparing it for transport. 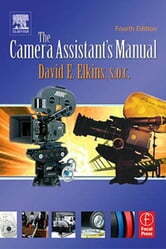 The Camera Assistant's Manual teaches the complete workflow in easy-to-understand terms and does not assume prior knowledge. It is a must-have on the set for camera assistants and is loaded with reference material such as camera illustrations, forms, charts, checklists, and equations. Invaluable career advice rounds out the book.